St Anne’s was situated in Lenaboy Castle on Taylor’s Hill. The old part of that building dates from the early 18th century. The house, which was situated on 63 acres of land, belonged to Colonel James O’Hara who was, in 1885, chairman of the town commissioners, and who founded a number of Galway industries. A lane led from the house to the gate of the estate which was beside where the Warwick Hotel is today. In 1913, David Syme, the manager of Guinness’ Galway branch, leased the estate but had to move out when the Black and Tans took over the place. It was here that they tortured and shot Fr Michael Griffin. The Sisters of Mercy then took it over and ran it as an orphanage for girls, and called it St Anne’s. While the regime there was not as tough as St Joseph’s in Lower Salthill, it was still very severe and occasionally violent. It was said of one nun that “She’d beat you black and blue with a stick, you’d be hit on the hands and then she’d follow you around the classroom belting your back, your legs and your arms.” One former inmate could remember nothing of her life there from ages five to 11, another had most of her hair cut off with a breadknife as a punishment. Many of the girls were transferred to the Magdalen Laundry when they were 11 or 12 years of age. It was not all bad, many local people would take some of the girls out for a weekend to experience ‘normal’ family life. The staff of Lydon’s Restaurant would have them collected by volunteers and brought into town for Christmas dinner. Frank Rafter, the manager of the Estoria Cinema, would bring them all in for a matinee of films that had passed the censorship imposed by the Mercy Sisters, films like The Nun’s Story. 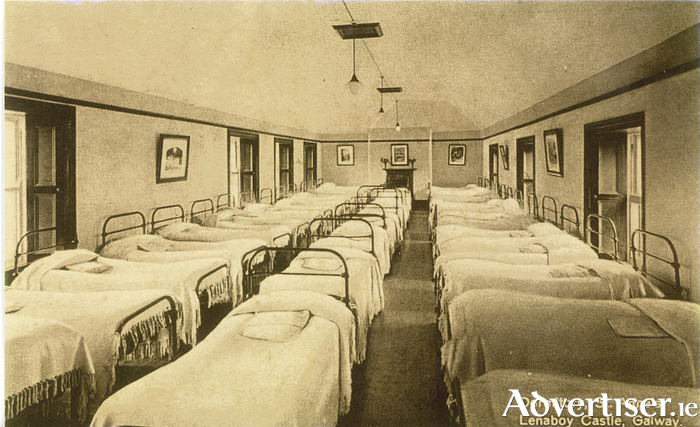 Our photograph shows the grim dormitory in St Anne’s and gives one an idea of why many of the girls experienced feelings of fear, entrapment, and the idea that ‘all hope was lost’ for them. The parkland attaching to the premises was gradually sold off to meet expenses. In the 1960s, the Government made a grant of £40,000 to the orphanage but only £20,000 appeared in its account. Bishop Michael Browne wanted to divert the other £20,000 to finance sending priests abroad for the missions. A delegation from the Junior Chamber of Commerce, Seán Ashe, Ambrose Joyce, and Brian Casburn, challenged him on the shortfall and he reacted furiously. When they gave him an ultimatum and threatened to expose his action to the media, he was forced to back down and the money was restored to the orphanage account. The orphanage was eventually closed down and the building was taken over by a team of social workers from the Western Health Board.